If you are just starting to make your own cards, knowing how to fold cards from single sheets of cardstock is a useful technique to learn. Folding the cardstock in different ways will create a variety of different looks and styles for your cards. ​Make cards from standard size paper by simply varying the way that you fold your paper or cardstock. Many different styles and types of handmade cards can be created from standard sizes of paper and cardstock, such as letter or A4 size paper. The different styles of card each provide different design opportunities and very different looks can be achieved by changing the fold or orientation of your card. Remember, whatever type of card you make, achieving a good, crisp fold is essential to getting a professional looking result. The portrait fold is one of the most basic card folds and it is easy to make two cards from a standard sheet of letter- or A4-sized paper. A simple portrait card is one where the height of the card is longer than the width. This is a very simple type of card to make and can be folded from standard pieces of card and paper. The long layout makes a portrait card ideal for many designs. The name originates from the fact that portrait orientated paper was ideal for displaying a head and shoulders portrait. This means that this style of card, with the height longer than the width, is ideal for photos or a central feature with a sentiment stacked below or above it. Two portrait orientated cards can be made from a single piece of letter or A4 paper by cutting the paper in half first. The fold line should go through the center of the narrow width of the card. A piece of letter-sized paper (8.5-by-11 inch) folded in two to make a portrait orientated card will make a card that measures 8.5-by-5.5 inches. Half a piece of letter paper folded in two will make a card sized 4.25-by-5.5 inches. A landscape fold card is ideal for displaying photos. This is also easy to make from standard sized paper. A landscape card is one where the width of the card is longer than the height. The fold can be at the top or the side of the card. The term landscape originated from the fact that this orientation is better for displaying wide images such as landscapes. For handmade cards, this style is ideal for displaying a photo, or a feature image and sentiment presented side by side. Two Landscape orientated cards can be made from a single piece of letter or A4 paper by cutting the paper in half first. The fold line should go through the center of the narrow width of the card. A piece of letter-sized paper (8.5-by-11 inch) folded in two to make a Landscape orientated card will make a card that measures 8.5-by-5.5 inches. A gatefold card has many uses and is particularly good for invitations. On this page, we are looking at making a simple gatefold card from a piece of letter or A4-sized paper. You can also create a simple gatefold card from 12-by-12 inch paper. Details and a folding plan can be found on the following page. A gatefold card is slightly different from other basic cards. Instead of having a single fold, a gatefold card has two folds, each forming a flap that meets in the center on the front of the card. This is an interesting style of card and presents many opportunities for creative ideas. In addition to decorating the two cover panels, the inside of the card is also ideal for decorating. Both the inner panels and the inside back of the card can be decorated in a complementary style. An additional design flourish can be added to a gatefold card by creating a closure or overlapping panel to sit on the front of the card to hold the two cover flaps together. A gatefold card is a versatile type of card that can be used for many occasions. It is particularly well suited to a wedding or party invitations where the inside of the card can be used to provide important information about the event. While a gatefold card is a little different to look at, as with the portrait and landscape style cards, two card blanks can be made from a single sheet of letter or A4-sized paper. This will make a card sized 4.25-by-5.5 inches. Gatefold cards can also be folded from 12 -by-12 inch paper or cardstock. This is useful if you want to make a card from scrapbooking paper. A gatefold card, created with two panels that fold into the center of the card can be used in many ways. This card is simple to make from standard sized paper making this a great project for beginners. Here we look at making a gatefold card from a piece of 12-by-12 inch paper or cardstock. One sheet of paper will make two 6-by-6 inch cards. This style of card is also simple to make from a standard letter or A4-sized card. More information and a folding plan can be found on the previous page. While a gatefold card is a little different to look at, as with the portrait and landscape style cards, two card blanks can be made from a single sheet of 12-by-12 inch paper. This will make a card sized 6-by-6 inches. A square fold card is a versatile shape that also works well as a gift card. Here we look at making a square card from a piece of 12-by-12 inch paper or cardstock. One sheet of paper will make two 6-by-6 inch cards. While a square card can be cut from any piece of paper or cardstock, using a sheet of 12-by-12 inch paper is an efficient way to get the most from your paper or cardstock. This is particularly useful if you have several cards to make. This is useful if you want to make a card using your favorite scrapbooking or decorative papers. You can also make a 6-by-6 inch gatefold card from the same size piece of paper. See the gatefold card from a 12-by-12 inch paper page for more information and a folding plan. A trifold card offers plenty of opportunity for creative designs. The term trifold originates from the fold used to create leaflets from a sheet of paper. A trifold creates uses two folds to create three panels. 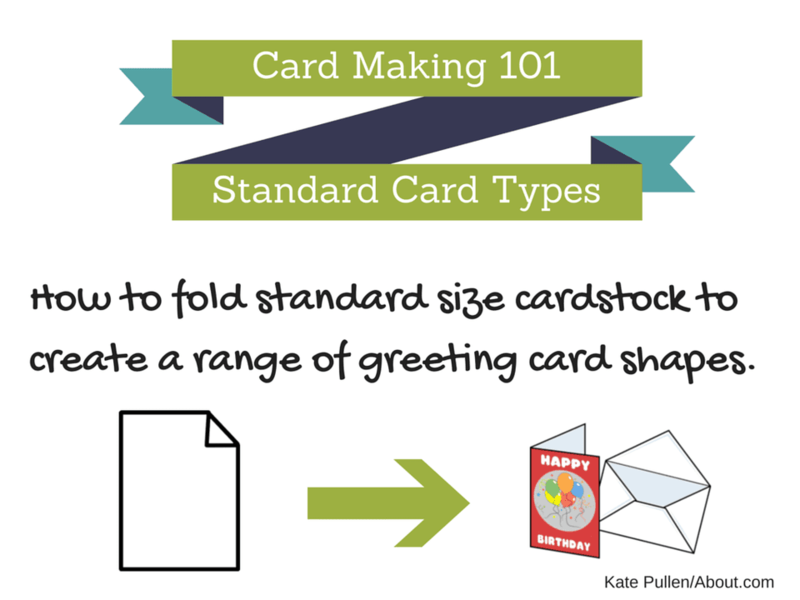 In card making the term trifold can be used to describe a variety of card types. At its most simple, the term trifold could be used to describe a card that is folded into three 'Z' style. However, the term could also be used to describe an aperture card or one or more complex trifold designs that are popular with card makers. Simple trifold cards are versatile and are a great way to present information in an attractive way. They are ideal for invitations where the front of the card can be decorated and the other panels used to present important information. An aperture card is folded so a design or photo is framed within the front cover of the card. An aperture card can also be known as a window card. The front of the card has a central window. This is used to make a feature of an image or photograph. An aperture card is often a trifold card, which is made from a single piece of card that is folded in three. The aperture or window is in the center panel, the left panel folds back over this to provide a back to the window. To add decoration to an aperture card, either stamp or add decorations directly to the inside of the panel or create your design on a separate piece of paper and attach this to the card. Use double sided tape or adhesive to adhere the front panels of the card together. Aperture cards can be used in many ways and offer plenty of scope for decoration. In addition to using the window or aperture to display a photo or image, you can also decorate the front of the card. This can create an attractive frame for your photo or central image. What Are Pattern Edge Scissors and How Can You Use Them in Your Crafts?